Leeds, Ala. – The weather conditions turned decidedly cooler today at Barber Motorsports Park, perfectly mirroring the demeanor of young Florida racer RC Enerson. 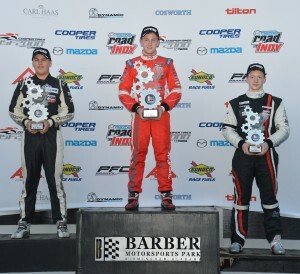 The 16-year-old from New Port Richey made a perfect start from pole position and controlled the final round of the six-race Cooper Tires Winterfest for the Cooper Tires USF2000 Championship Powered by Mazda to secure both the race win and the mini-series spoils for Team E Racing. Englishman Michael Epps, who started second, needed to win the race and gain the bonus points for fastest race lap and leading the most laps in order to wrest away the title from Enerson. Epps wasn’t quite able to match his double race-winning form from yesterday – and came up just 0.003 shy of claiming the fastest lap point, which also went the way of Enerson – but still came away with yet another podium finish and second place in the final points tally. His efforts also ensured a comfortable Team Championship victory for Belardi Auto Racing. Teammate Florian Latorre, from Libourne, France, held third place in the early stages before slipping back to fifth behind former F1600 Championship Series protagonists Aaron Telitz and Jake Eidson, who continued their battle from yesterday afternoon. Once again it was Telitz (ArmsUp Motorsports), from Birchwood, Wis., who came out on top – by just 0.602 of a second on this occasion – to claim a well-deserved maiden podium finish. 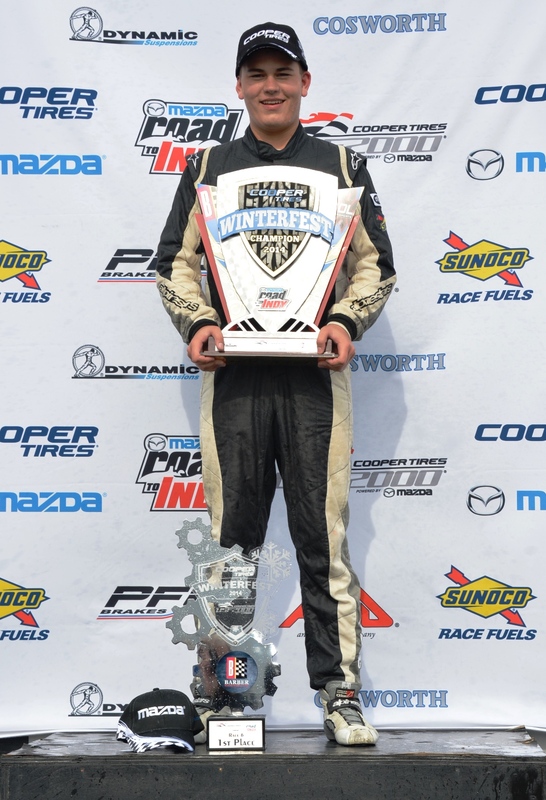 Fourth place, meanwhile, was enough for Eidson (Cape Motorsports with Wayne Taylor Racing), from Lakewood, Colo., to clinch third place in the Cooper Tires Winterfest. Clarke Toppe, from The Woodlands, Texas, who scored his first victory at NOLA Motorsports Park last Saturday, posted another fine performance for JDC MotorSports. The 16-year-old lost a place on the opening lap to fall back to 11th, but charged hard thereafter to rise all the way to sixth ahead of teammate Scott Andrews, from Torquay, Victoria, Australia, who also made good progress from ninth on the grid. Austin Cindric ran well in sixth during the early stages for Pabst Racing, but slipped back to ninth at the finish behind Peter Portante (ArmsUp Racing). 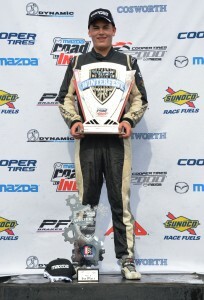 Felipe Donato, from Sao Paulo, Brazil, completed the top 10 for JDC Motorsports after a protracted battle with Daniel Burkett (Belardi Auto Racing). The regular USF2000 season will kick off on the Streets of St. Petersburg, Fla., on March 29/30 with a double-header event in support of the IndyCar Series. Leeds, Ala. – Englishman Michael Epps not only claimed his first-ever USF2000 victory today in Round 4 of the six-round Cooper Tires Winterfest at Barber Motorsports Park, he also put an exclamation point on his day by dominating Round 5 later in the afternoon. Epps became the fourth different winner in as many races over the past five days. Belardi Auto Racing teammate Florian Latorre ensured an excellent day for the Indianapolis-based squad by claiming a pair of podium finishes, while RC Enerson, from New Port Richey, Fla., maintained his championship lead by virtue of finishing fourth and second in the day’s two races for Team E Racing. 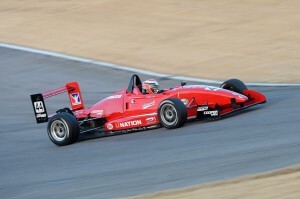 Epps, 21, from Hemel Hempstead, England, was keen to build on his momentum after finishing third in the final race at NOLA Motorsports Park last Saturday. He did so in style this morning by claiming his first pole at this level. After a brief rain shower obliged the entire field to switch to wet-weather Cooper tires on the grid, Epps slipped back to third place in Turn One behind Latorre and Brazilian Victor Franzoni (Afterburner Autosport), who made a spectacular getaway to vault from sixth to second. The Englishman quickly set about redressing the balance following an early caution period. Epps claimed two wins on Saturday at Barber Motorsports Park, but it wasn’t quite enough to give him the overall victory. 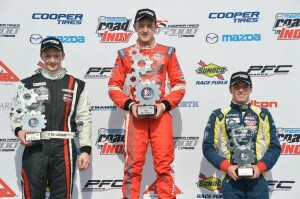 Photo courtesy of USF2000. Epps displaced Franzoni at the restart, then tracked down Latorre before making a decisive move to the inside under braking for Turn Five on Lap 11. Once in front, Epps inched away to win as Latorre barely managed to edge out Franzoni for second. Enerson finished fourth despite intense pressure from Jake Eidson (Cape Motorsports with Wayne Taylor Racing). A little farther back, Peter Portante snuck past ArmsUp Motorsports teammate Aaron Telitz for sixth on the final lap. The track was fully dry for Race Two, and this time Epps remained in control throughout. His progress was interrupted by a couple of full-course cautions, but he was perfect on each of the restarts and took the checkered flag 1.948 seconds clear of Enerson. 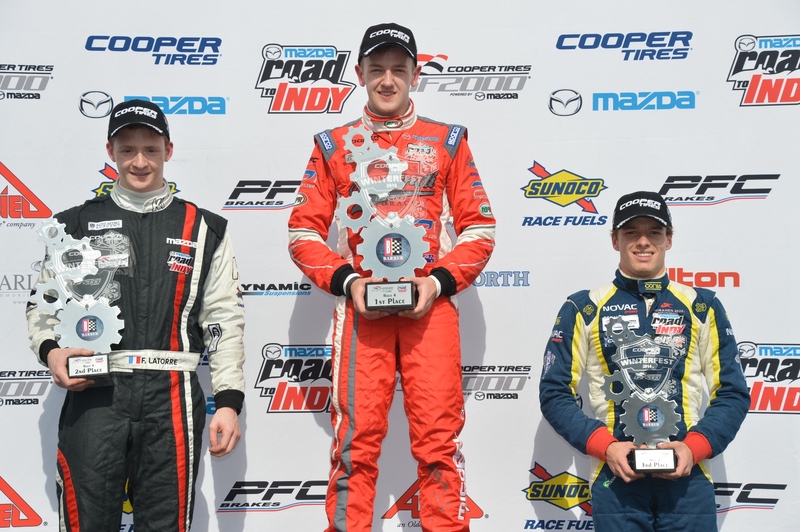 Latorre ran a relatively lonely third, while Telitz took a fine fourth following a race-long scrap with Eidson, with whom he had battled for last year’s F1600 Championship Series crown. On this occasion is was Telitz who emerged on top. 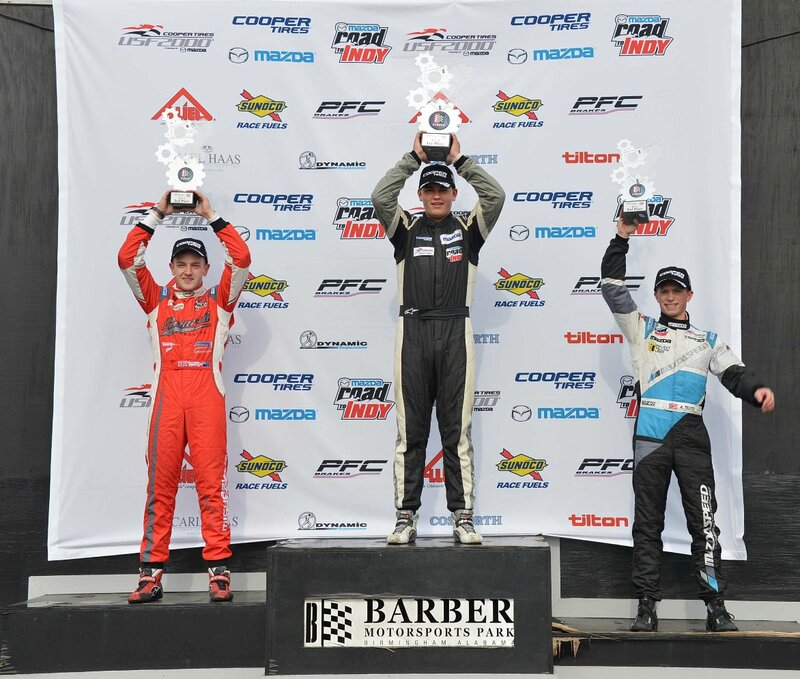 Austin Cindric (Pabst Racing), the youngest driver in the field at age 15, enjoyed his best race so far, rising from 12th on the grid to sixth ahead of Portante and JDC MotorSports teammates Clark Toppe and Scott Andrews. 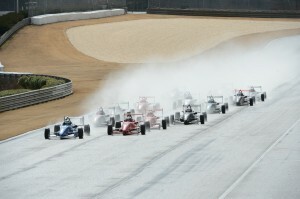 It was a wet start for the first USF2000 race at Barber Motorsports Park. 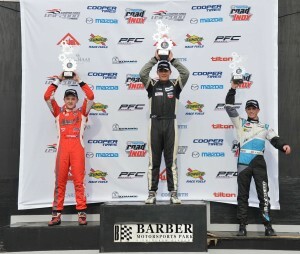 Photo courtesy of USF2000. The extra championship point for fastest race lap means that Enerson holds a slender seven-point advantage, 114-107 over Epps prior to tomorrow’s final race. In the Team Championship, Belardi Auto Racing holds a healthy 31-point margin over Team E Racing. Michael Epps #44 P1 Sports/UNATION/iRacing/Anytime Fitness UK (Belardi Auto Racing): “This was a similar kind of race as Race 1 except I didn’t get passed at the start but there was still pressure on me. RC [Enerson] was there the whole time and I could see him but I seemed to have control over the gap and didn’t want to overdo it and take it off. I got a radio call saying I’ve been pipped for the pole [for Race 3] by like half a tenth. I tried on the last lap but I couldn’t get it right and got a couple of apexes wrong so I’ll start P2 tomorrow but it was a cracking day – a pole, win, win. It was perfect. Find the race reports from the opening rounds of Cooper Tires Winterfest at NOLA Motorsports Park here.